Bean’s discussion of tax shelters includes KPMG, an accounting firm that, as she later shows, had been actively advertising tax shelters to its clients and potential clients. Mostly serving wealthy individuals and families, KPMG’s behavior went far beyond any reasonable standard of ethical practice and, in at least some cases, violated the law. The company offered stiff resistance to the PSI probe, stonewalling the subcommittee on documents requested in subpoenas and denying the intent of its tax strategies during hearings, even when internal correspondence directly controverted the company’s claims. In spite of KPMG’s obfuscations, the PSI succeeded in shining a spotlight on the firm’s questionable behavior and a later DOJ investigation, based in part on KPMG documents obtained from the subcommittee, estimated that the firm’s strategies had cost the U.S. Treasury $2.5 billion in lost revenue. Bean’s characterization of KPMG and other firms such as the Quellos Group involved in similar schemes indicate just how much abuse lurks beneath the byzantine accounting structures that some companies use to cover their tracks. She shows in a concrete way what years of study and reporting have demonstrated in the abstract: Abuse of tax shelters is rampant. Of course, most schemes to shift profits into tax shelters cannot succeed without secrecy on the part of banks and at least some of the government agencies overseeing them. In recounting her experience prying into these sorts of opaque banks, Bean describes a set of tactics that can be at once brazen and obtuse used to flummox U.S. federal authorities. She focuses on investigations into UBS and Credit Suisse in Switzerland, as well as LGT in Lichtenstein, explaining that banks could, for example, mask accountholders’ identities by stashing their assets in accounts under another person’s name while making clear through internal documents who really controlled the money. Furthermore, she shows that the banks’ host countries were heavily complicit in the financial structures used to create tax havens, refusing inquiries and extradition requests from foreign governments. She describes one encounter with a Swiss bureaucrat in which he simultaneously asserted that Switzerland has no bank secrecy laws and refused to divulge the names of foreign accountholders in Swiss banks. The attention that PSI brought to secretive banking practices helped to germinate tangible reform in 2010 with the enactment of the Foreign Account Tax Compliance Act (FATCA), which requires foreign banks to divulge the names of their US clients or pay a hefty fee. Not only did this measure pull back the curtain on many US citizens attempting to hide assets in foreign banks, but it set in motion a sequence of policy changes that normalized analogous policies outside of the United States, culminating in amendments to OECD conventions that authorized automatic cross-border information exchanges. As much as the PSI’s investigations into individual behavior revealed dysfunction in the international tax system, its examination of corporate behavior generated many of the truly eyebrow-raising practices described in Bean’s book. She focuses on investigations into four companies: Hewlett-Packard, Microsoft, Apple, and Caterpillar, which had engineered suspiciously low tax burdens for themselves through methods such as artificial licensing fees and abusive short-term loans with foreign subsidiaries. Apple had even constructed a subsidiary that was, due to shrewd manipulation of differences in U.S. and Irish tax law, not a tax resident of any country. As with so many targets of PSI investigations featured in Bean’s book, these four companies were often gallingly bold in their defensive tactics. Caterpillar, for example, claimed during a 2014 hearing on its tax practices that the IRS had never objected to the company shifting billions of dollars in profits to a Swiss subsidiary, in spite of a letter from the IRS released in a subsequent SEC filing showing that they very much had. The picture of corporate conduct that arises from Bean’s book is a familiar one, but seeing it laid out step by step through the process of an investigation reinforces just how deeply entrenched the underlying flaws in the tax code that enable it have become. Some of what PSI uncovered in Bean’s years with the committee violates our tax laws, and in those cases, the answer is usually for Congress to provide the IRS with the tools (whether increased funding or additional powers to collect information) to enforce existing law. In other cases, the committee uncovered tax avoidance that is technically allowed under our tax laws — which is perhaps the bigger scandal — and in those cases, the responsibility lies squarely with Congress to close tax loopholes. That many of these practices had remained largely invisible prior to the PSI investigation illustrates just how profound a barrier opaque corporate accounting is even for Congressional committees with the benefit of legal expertise and subpoena power, let alone for members of the public. Greater transparency in financial reporting is one of the most important actions that reformers can take in weakening the secretive environment that the PSI team had to spend so much time and energy to penetrate, especially requiring public country-by-country reporting for corporations. Under current rules, untangling the web of foreign subsidiaries that some companies use to shield their assets requires a prohibitive amount of time and resources, and mandating more transparent reporting would allow lawmakers and the public to analyze corporations’ behavior and react accordingly. 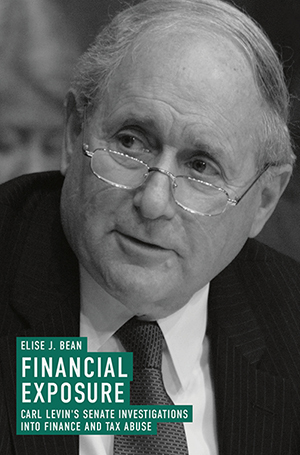 While Financial Exposure lays out an enraging landscape of financial misdeeds, Bean surrounds her narrative with profound optimism about the role that well-meaning civil servants can play in fostering good government. For every story of powerful individuals and corporations distorting the law that she tells, she includes at least one of PSI staff working long hours, stretching limited resources, and pushing through ramparts of corporate recalcitrance to get to the truth. In more than one case, she emphasizes the ways in which their efforts pay off, bringing particular misdeeds to the attention of the public and sometimes attracting the focus of other government agencies with the ability to pursue legal action. Financial Exposure is an account of all the ways that the system is broken but also how it can be fixed.